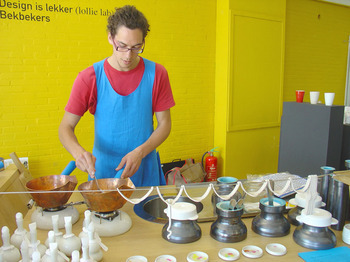 Café Dudok in Arnhem prepared a special menu in honour of the Arnhem Fashion Biennale. Dutch Art Institute student, MuXue and I were visiting Arnhem for other reasons entirely but we did manage to end the day with an hors d’oeuvre and dessert at said café. 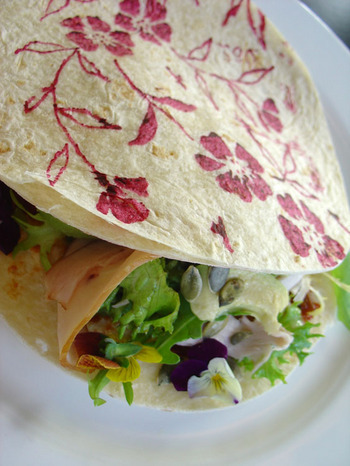 The starter, a smoked turkey avocado and edible flower ‘wrap’, was printed in a floral pattern with cherry red pigment. It was most unfortunate that the pigment had no additional flavour because it would’ve been great if the pattern was made out of salsa picante for example, with an overlay of patterned guacamole and maybe cutout smoked turkey in pretty tailored shapes. Bring on les ruches! Also the California-Dutch in me always feels inclined to let folks know that ‘wraps’ (let’s just call them white flour tortillas from now on) really should be served warmed up to arouse the subtle flavours of the nutritional void that is white flour. The dessert of this fashion menu was presented rather simply and therefore I reacted to the lack of pretension with less venom. Visually it reminded me of Allsorts licorice candy. It was a dessert of blocks and a worthwhile array of textures, had some of the flavours not come from directly out of standard bottled essences. MuXue and I felt we were served far too much food, but that’s something that seems to be inescapable these days. 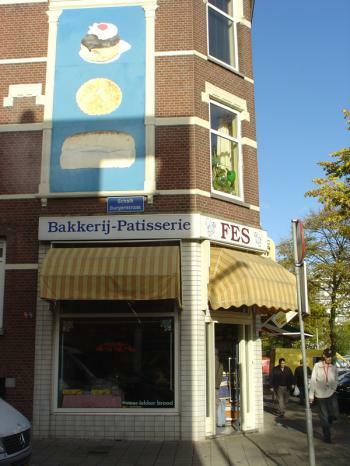 The service was great by the way, and this is a rarity in a café in the Netherlands. 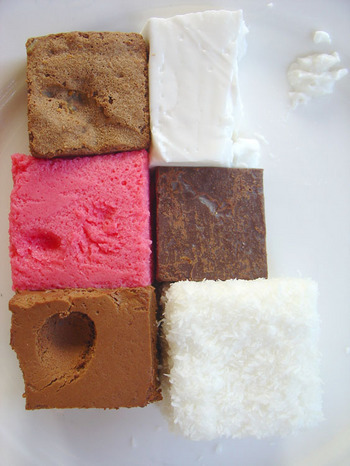 Squares from top left and top to bottom: walnut fudge brownie, bitter almond pannacotta, raspberry bavarois, dark chocolate-raisin fudge, cake au mousse au chocolat, coconut snowball. 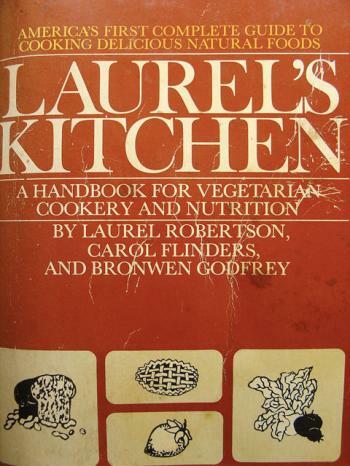 The finger pokes in the mousse and in the raspberry bavarois are the author’s own. When I get back from yoga I’ll tell you what these pictures are. 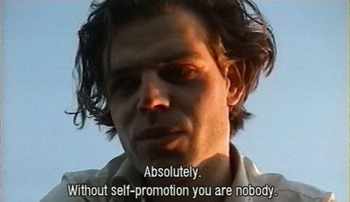 I’m starting a more informal culiblog. oooh, those are purty. your food pics are just lovely, and so imaginative! Thanks for the sweet comment. You are an evil person for introducing me to an online store with so many shoes that I like. I’ve never been to the real store as you can tell. Between Anthro and Office, I’m in trouble. Hey, wait, this isn’t a shoe fetish blog!